Long ago, in the name of a meaningless war, countless crimes have been committed. That made upset the gods. ...whoever started to kill creatures, human or not: that's what people say. War stopped immediately. Still the Empire started to make human tests to learn more about the curse... the infamous .........Curse of the Gods!!! Ok, someone might remember my thread about reversing HP and MP progression... well, surprisingly i managed to implement the required ASM code on my own. - The balance of the game gives you a wide choice: will you escape from the curse, or embrace it at your own risk? A Cursed character will be left alive with 0 HP and being able to use only fight command, since the parameters will be drained, basically the charater will turn into a vegetable for the rest of the game: the best idea you can have is to leave him in the airship until the end. 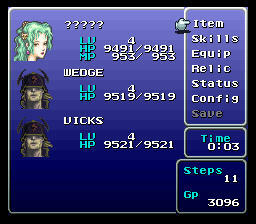 Are you interested to live a completely new FF6 experience? I don't mean to sound rude, but it seems like this hack punishes people who play too much. I mean, if you play a lot, everyone's gonna be useless vegetables eventually. If you don't LLG the game but still want to complete the subquest, then i want you manage to do that, you'll be strong, but your HP will make you frail. I want to put a line that the player don't have to cross... this limitation will be something that you'll have to consider for the whole gameplay. On a side note the theme of the hack(at least starting from v1.0) won't be to dodge battles, rather than dodge the curse... It's difficult to explain it right now, but when the time will come, everything will be clear. This sounds..... really cool. Now, will level averaging be in CotG? I hope it isn't, but I can see why it would be, as there's a curse effecting everything. Atma Weapon's going to be godly to have when you first find it (unless of course it's being removed or something). Or maybe the Atma Weapon's been cursed too, so the LESS health you have the stronger it gets, like it's EATING YOUR SOUL. Nomnomnom. Now, what level in general would a character be once they'd become a vegetable? I figure a nice sweet spot for vegetable-tality would be like lv60-70 (or say lv50 in Strago's case), with health decreasing like crazy the last 5-10 levels. Kind of like the curse is finally breaking them down at that point. In any case, can't wait to see where this goes! I still have to think on how Atma and Valiant knife will work, anyway at the moment Atma will get a great benefit from low levels, but at the same time you need of an high level modifier... so the ideal moment should be LV 50. Another neat idea that i'll implement almost for sure is that the old man will give you a shiny Paladin Shield, but it's almost consumed from the curse, so... after 3 battles Paladin Shield will turn into a Cursed Shield... forever. 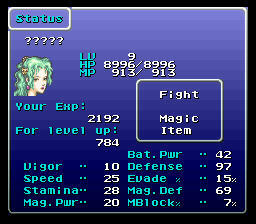 That means that at level 98-99 the curse will burn your soul... if you don't ask for help to espers: say you keep use one esper that boosts HP bonus to +100%, you'll get 198 HP each level in this way, so the curse will get you at lv 49-50 in the worst of the cases. 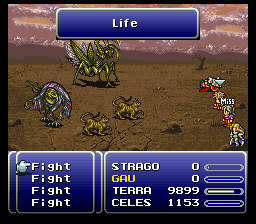 I believe Atma actually doesn't factor HP into the calculations, but rather subtracts damage if you're missing HP. So if a character has 9700/9700 and another has 63/63, but they both have the same level, they will both do the same damage. So... what makes the difference? HP or vigor? I've pulled the Atma Weapon section from it and pasted it here. 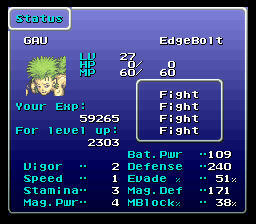 Based on step 10b, it appears that damage is basically calculated on a percentage of your hp. Though, Vigor still has just as much of an effect as it does on every other weapon, for what it's worth. The only thing harder than finding a needle in a haystack is finding a haystack in a needle. Yeah, Atma Weapon shouldn't be affected much at all. As has been said, its damage modification based on the wielder's missing HP related to their max. The Valiant Knife, on the other hand, has a flat +1 damage for every point of HP its wielder is missing. So if you manage to keep that character's max HP in the 9000s and run around with them in near death state, they'll be getting greater than 6000 bonus damage just based on their missing HP.